So, you have a concrete structure with a problem. Maybe it is concrete shrinkage cracks, broken concrete, spalling floor joints, or, falling concrete that is causing a safety hazard, or water leakage. Or, maybe you are restoring an old concrete or steel frame masonry building or adding more equipment to a concrete slab in an industrial plant. The good news is that there are professional concrete repair and preservation solutions that are effective in making structures last longer. One thing that we have learned is that a simple “patch” is not a long-term solution. To achieve long-term extension of service life, there are many factors which should be considered. First, an evaluation of the structure should be conducted by a experience and knowledge team. This can include visual inspection, non-destructive testing, destructive testing and structural monitoring. 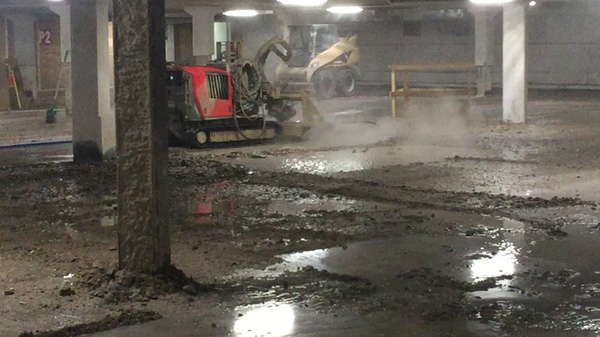 Once the cause, magnitude and extent of the problem is determined, and concrete repair is required, a repair and maintenance strategy can be developed that takes into consideration various factors such as the owner’s criteria, engineering requirements, and historical, environmental and sustainability factors. Should I repair or replace my concrete structure? This is an important decision for an owner to make. There are economic considerations such as budget, cash flow and life cycle costing for long term owners. There other non-economic considerations, too such as historical value and environmental impact of demolishing and rebuilding. Following a process similar to this will ensure that all relevant information is considered and the project is design to meet the long-term needs of owners of infrastructure. 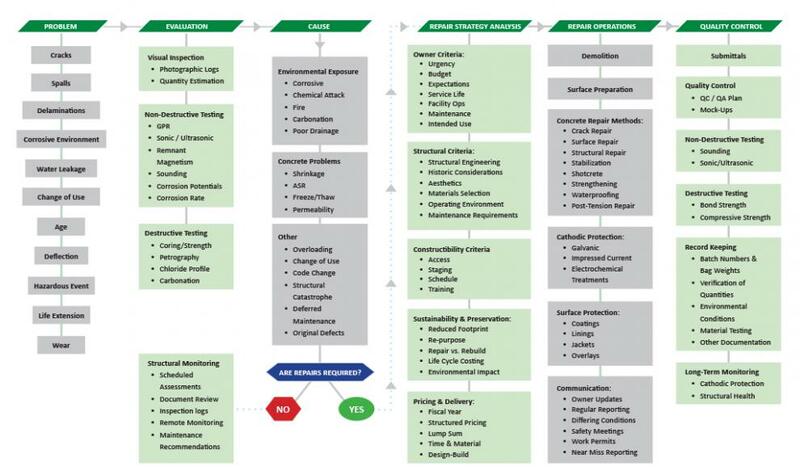 This flowchart will help you navigate through the process of identifying common concrete repair issues and lead you to the right solution.